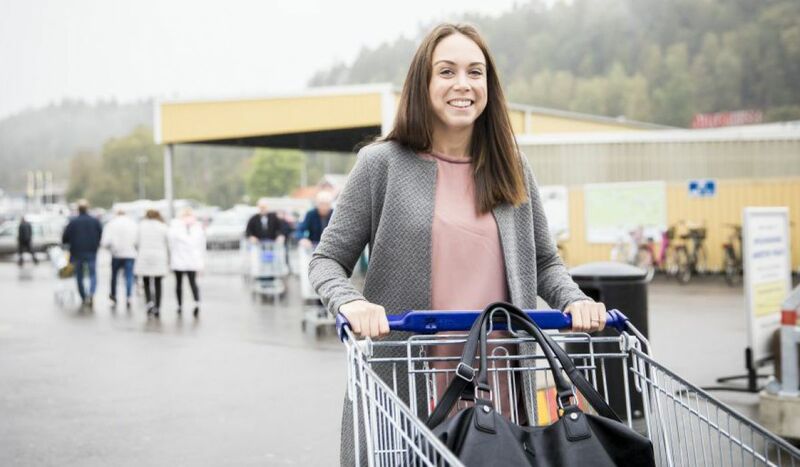 A visit to Ullared is a unique shopping experience. Whether you’re coming for the day or staying overnight with us, we’ve put together a few tips that will help you prepare for your visit. Here you can read about everything from opening hours to where to park, where to find the Pharmacy, where to walk your dog and how to order a bottle of wine for the evening from ICA, etc. We look forward to seeing you at Gekås Ullared! Next to the Play Centre on Floor 3, next to the stairs, there is a charging cabinet for mobile phones. Here you can charge your mobile in a locked cabinet while you eat, play or shop. At Gekås Ullared you can surf for free everywhere! Whether you’re in the superstore, hotel, motel, campsite or cottage village. Naturally, it’s free to surf in the Play Centre or when you take a break from shopping for a coffee or something to eat in the Restaurant, Sports Bar, Salad Bar or Cafe Bar. Connect to Destination Ullared. You don’t need to log in. There are no trolleys inside the superstore, only in the car park. Make sure you have a token, five-kronor or ten-kronor coin with you. There is a change machine next to the trolley park nearest to the store. All our trolleys are marked with colours and numbers on the handle. Remember your trolley number so that you don’t take the wrong trolley in the crowds of shoppers. You can also flag your trolley with a colourful string or some other feature to avoid taking the wrong trolley. If you need a trolley with a baby seat, or a wheelchair-adapted trolley, you can ask the staff in Customer Services or the Securitas guards at the entrance or exit for help. On Floor 2 we have a large trolley park where you can leave your trolley, for example if you take a break on Floor 3. With the help of the colour-coding and numbers, you’ll easily find your trolley again. Ordinary non-prescription medicines such as painkillers, nasal sprays and quit-smoking products can be bought in the Game Shop outside the checkout line. If you are looking for a wider selection, there is a pharmacy at Danska vägen 1 in Ullared. The checkouts accept the following currencies: SEK, DKK, NOK and EURO. If you need to withdraw cash, we have cash machines near to the store, one outside the entrance and one outside the exit on the way to the car park. There is a coin machine at Customer Services. Here you can exchange your coins free of charge. Do you drive a biogas car? If so, you can take the opportunity to fill up when you visit Ullared! You can find the filling station at the entrance from Falkenberg, at Falkenbergsvägen 21. Each charging point has two outlets of Type 2 (16-32 A 230 V, 3.7–7.4 kW). Charging is completely free for our customers. Remember to bring your own charging cable. From October 1, you can hand in your worn-out electrical and electronic products to us when you buy a similar new product from us. Hand in your worn-out electrical product to us at Exchanges and Returns before you shop. You can also, as previously, hand in worn-out electronics to municipal collection points. You can find the nearest recycling centre on your municipal website or via www.sopor.nu. Good for you and good for the environment! Read more about producer responsibility and how electronic products are recycled at El-kretsen.se. There is a total of 6 defibrillators at Gekås Ullared. They can be found at different locations around our entire site. See below for a list of places where you can find defibrillators. We have around 4.8 million visitors per year at Gekås Ullared. So it’s reassuring to know that we have defibrillators in place in case of accidents. – Superstore customer exit, at the security guard desk. Everyone should be able to use the defibrillators in the event of heart arrest. Our trained illness/accident team is on the premises 24 hours per day, all year round. Telephone 0346-37557.